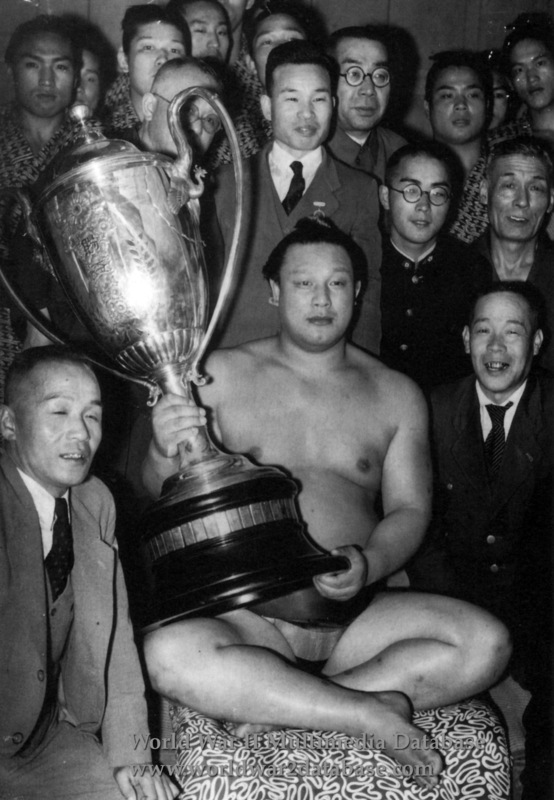 Sadaji Futabayama (1912-1968) holds the Emperor's cup after his 1942 win, his ninth title. Sumo, traditional Japanese wrestling, was interrupted in 1945 because of the bomb damage. Futabayama was the 35th yokozuna (grand sumo champion) and his record was 276 wins, 68 losses, 1 draw, and 33 yasumi (absences) wrestling in the Makuuchi Division, the top level of Sumo wrestlers. He won the Emperor's Cup twelve times. Sumo was an approved sport by the Japanese militarists, which thought it upheld the best aspects of Japanese culture because of its origins in Shintoism. Sumo wrestlers were specially treated and received many gifts when they attained fame. Futabayama helped increase the sport's popularity. It provided a much needed distraction from the war after his first Championship win in 1937. Post-War he ran the Japan Sumo Association and founded his own Sumo school.